The yearbook of Hephaistos is a useful, and praiseworthy annual project of photographically documenting the work of several different master blacksmiths from around the world. Each annual has a brief biography of the smiths and a large number of beautiful photographs of their work. Each annual, in fact, contains hundreds of high-quality photos. useful, and praiseworthy annual project of photographically documenting the work of several different master blacksmiths from around the world. Each annual has a brief biography of the smiths and a large number of beautiful photographs of their work. Each annual, in fact, contains hundreds of high-quality photos. 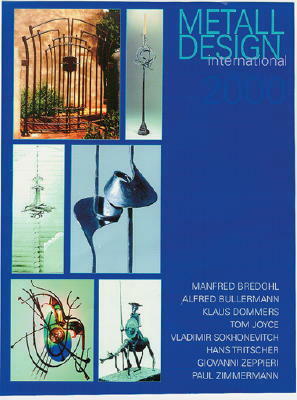 The 2000 edition showcases the work of the following master smiths: Klaus Dommers (Germany), Vladimir okhonevitch (Russia), Paul Zimmermann (Germany), Hans Tritscher (Austria), manfred Bredohl (Germany), Tom Joyce (New Mexico, USA), Alfred Bullermann (Germany), Giovanni Zeppieri (Italy). Following is an excerpt from the preface of the 2000 edition: "...great importance has to be attached to regional and local idiosyncrasies, to sedentary roots, which have been inherent in blacksmiths since times immemorial. Globalization is threatening these loveable small differences. Designers in the craft should be keen on counter-acting this egalitarianism. We would look upon a very miserable future of design if world-wide applicable standards and international guidelines were to apply in the future. Compiling this book has been a lot of fun because the eight metal workers presented are entirely different personalities and thus equally different methods of working meet. They present a breadth of metal work which could not be any greater."